United Christian Hospital (UCH) is a community hospital come under Kowloon East Cluster. Since establishment in 1973, UCH has been providing comprehensive medical and social care to achieve the objectives of holistic healthcare to each patient. To cope with rapid growth in demand, the Government committed to the expansion project of UCH in 2011. To fulfil the dynamic medical needs of Kowloon East District, a new building will be constructed for enhancing ambulatory care and cancer services. The expansion project has started in 2012 and is expected to complete in 2021 at the expenditure of around HK$10 Billion. UCH was in the past a subvented hospital. As the parent organisation, United Christian Medical Service has to bear part of the expenses on the expansion project. Legislative Councillor (Kowloon East), Hon. 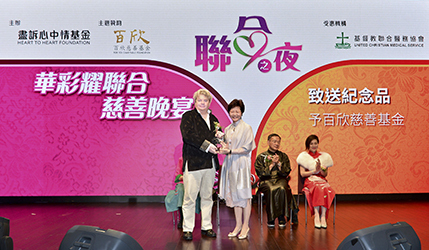 Mr. Paul Tse JP, has initiated a charity gala dinner to raise funds for supporting that purpose. The event was organised by Heart-to-heart Foundation and friends of Hon. Mr. Paul Tse. It was a privilege to have Mrs. Carrie Lam, Chief Secretary of the Government and Prof. Sophia Chan JP as the guests of honour.